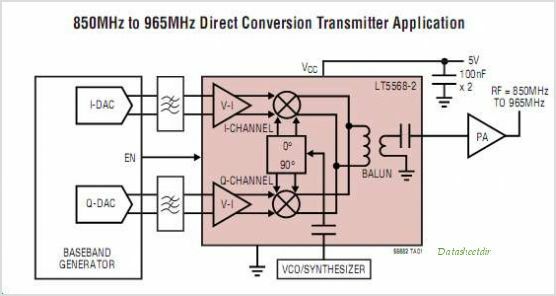 The LT5568-2 is a direct I/Q Modulator designed for high performance Wireless applications, including Wireless infrastructure. It allows direct modulation of an RF signal using differential baseband I and Q signals. It supports GSM, EDGE, CDMA CDMA2000 and other systems that operate in the 850MHz to 965MHz band. It may be configured as an image reject upconverting mixer, by applying 90 phase-shifted signals to the I and Q inputs. The I/Q baseband inputs consist of voltage-to-current converters that in turn drive double-balanced mixers. The outputs of these mixers are summed and applied to an on-chip RF transformer, which converts the differential mixer signals to a 50 single-ended output. The four balanced I and Q baseband input ports are intended for DC coupling from a source with a common mode voltage level of about 0.5V. The LO path consists of an LO Buffer with single-ended input, and precision quadrature generators that produce the LO drive for the mixers. The supply voltage range is 4.5V to 5.25V. This is one package pinout of LT5568-2,If you need more pinouts please download LT5568-2's pdf datasheet. 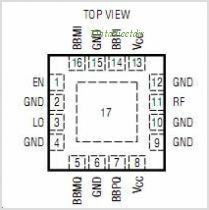 This is one application circuit of LT5568-2,If you need more circuits,please download LT5568-2's pdf datasheet.